Here is a quick primer of the range of food I offer to Cossack Cuisine customers. By the way, one of my recipes I use came from my great-great grandmother. Source: Mostly wikipedia. A zakuski (from the Russian закуски [zɐˈkuskʲɪ]; singular закуска, zakuska) is a Russian term for hors d’oeuvres, snacks, appetizers, served before meals. Usually presented buffet style, it often consists of cured meats and fishes, various pickled vegetables such as beets, cucumbers, and garlic, mixed salads, caviar, and breads. These appetizers are often present at parties or receptions, especially in Armenia and Russia. Usually zakuski are served away from the dining room. Pelmeni (Russian pronunciation: [pʲɪlʲˈmʲɛnʲɪ]; Russian: пельме́ни — plural, пельмень pelʼmenʼ — singular) are dumplings consisting of a filling wrapped in thin, unleavened dough that originated in Siberia and is a dish of Russian cuisine. Pelmeni are common in Russia and have similar names in other languages: Belarusian: пяльмені, pyal’meni; Tatar: пилмән(нәр) pilmän(när); Ukrainian: пельмені, pel’meni; Latvian: pelmeņi; Azerbaijani: düşbərə. The dough is made from flour and water, sometimes adding a small portion of eggs. 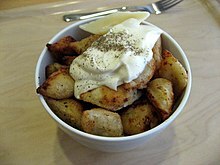 Fried pelmeni with sour cream, as served in Latvia. The filling can be minced meat (pork, lamb, beef, or any other kind of meat), fish, or mushrooms. The mixing together of different kinds of meat is also popular. The traditional Udmurtrecipe requires a mixture of 45% beef, 35% mutton, and 20% pork. Pelmeni in Perm (west of the Ural Mountains) are often filled with mushrooms, onions, turnips, or sauerkrautinstead of meat. Various spices, such as black pepper and onions, are mixed into the filling. Pirozhki (plural form of pirozhok, Russian: пирожок, пирожки, which means a little pirog), sometimes transliterated as piroshki (or pyrizhky from Ukrainian: пиріжки), is a generic word for individual-sized baked or fried buns stuffed with a variety of fillings. A common variety of pirozhki are baked stuffed buns made from yeast dough and often glazed with egg to produce the common golden colour. They commonly contain meat (typically beef) or a vegetable filling (mashed potatoes, mushrooms, onions and egg, or cabbage). Pirozhki could also be stuffed with fish (e.g., salmon) or with an oatmeal filling mixed with meat or giblets. Sweet-based fillings could include stewed or fresh fruit (apples, cherries, apricots, chopped lemon, etc. ), jam, or cottage cheese; The buns may be plain and stuffed with the filling, or else be made in a free-form style with strips of dough decoratively encasing the filling. Kotleti can be described as Russian pan-fried hamburgers, usually served with sides like sour cream, vegetables, rice or potatoes (never on a bun). They are different from American hamburgers because they are tender and crisp on the outside and moist and tender on the inside. Kotleti, a Western European dish popular in modern Russian households, if not burger-shaped are served as small pan-fried meat balls, not dissimilar from Salisbury steak and other such dishes. Made primarily from pork and beef (sometimes also from chicken or fish), they are easily made and require little time. Ground beef, pork, onions and bread are put in a bowl and mixed thoroughly until it becomes relatively consistent. Once this effect is achieved, balls are formed and then put into a hot frying pan to cook. Fish (ryba) was important in pre-revolutionary cuisine, especially on Russian Orthodox fast days when meat was forbidden, similar to the Catholic custom of eating fish instead of meat on Fridays. Strictly freshwater fish such as carp and sudak (Sander lucioperca, Zander) were commonly eaten in inland areas, as well as anadromous sturgeon and in northern areas salmon, pike and trout. A greater variety of fish—including saltwater species—were preserved by salting, pickling or smoking and consumed as “zakuski” (hors d’oeuvres). Typically Russians use game (such as elk, doe and wild boar) to cook a range of classic meat dishes. Russian stews (ragu) are often accompanied by noodles or dumplings or just good, multigrain or rye bread. Most popular is Beef Stroganoff (in Russian: Бефстроганов Befstróganov) is a dish of sautéed pieces of beef served in a sauce with smetana or sour cream. From its origins in 19th-century Russia, it has become popular around the world, with considerable variation from the original recipe. Vegetables (ovoschi) typically eaten by the Cossacks included cabbage, potatoes, and cold tolerant greens. Pickling cabbage (sauerkraut), cucumbers, rutabagas and other vegetables in brine is used to preserve vegetables for winter use. Pickled apples and some other fruit also used to be widely popular. Ridge cucumbers, with a firm texture and full flavor, are either used fresh in salads or pickled in jars for winter. Other popular vegetables are beetroot, potato, carrots, parsnips and mushrooms. Mushrooms are dried for use in soups and sauces, or salted or pickled for snacks with bread and vodka. They are also sauteed fresh in butter and herbs, or sauced with soured cream. Oladi – same as pancakes, but thicker and more feeding. Syrniki – can also be called “tvorog burgers” because they are made of tvorog and fried on a sauce-pan after. Usually eaten with honey, sweet dressings, or jam. I also cook many more varieties of food too. For a brief and interesting history of Cossack/Russian cuisine – go here. Our @home service includes Entertaining Made Easy. All the food will be served on my serving dishes and after the meal your kitchen will be cleaned up as if I had never been there. There are two types of meals to choose from … Formal or Buffet. i) Formal meals (8-20 people) are served to the seated tables, piping hot and ready to eat. ii) Buffets (20-250 people) are presented on a main table in dishes and food warmers. The food warmers can keep the food hot for 1 hour or so, while people help themselves. Formal meals of greater than 15 people, even have the pleasure of being served by beautiful Russian ladies in their traditional Russian dress. Just relax and enjoy a drink, talk with your friends or family and let me take care of the cooking. Note: Our other @home service is Meals Made Easy – more information here. Get your taste buds dancing to a new tune ! Tried all the popular Western and Asian cuisines ? Looking for a new authentic food experience ? We cater for all types of events with your choice of menu from our vast range of Russian dishes. Not sure? Come to one of taster events! Let Cossack Cuisine cater for your next event – birthdays, engagements, wedding, christenings, office parties, boardroom lunches, sporting events & more. Whatever the occasion I can offer you a bespoke service to make your event extra special and personal to you. If you would like an informal, no obligation, discussion regarding the catering I could do for you at your event then please contact me. What is “Cossack Cuisine” all about ? The Cossacks played an important role in the historical development of both Ukraine and Russia. During their raids in Turkey and Persia, the Cossacks picked up the customs of European, Caucasian and Oriental culture, including cuisine culture. Thanks to the Cossacks, today’s Russian cuisine owes its excellence to the food heritage of the vast and multi-cultural expanse of former Soviet states – a food heritage that Leeza Murina has incorporated into her own Cossack Cuisine experience. Cossack Cuisine’s Food Tasting Events offers you a great foodie experience. It’s a great way of getting your friends together and doing something different and enjoyable away from your home. Later this year, I will run a Food Tasting Event. We know many of you are unfamiliar with the food I make that’s why I offer you the chance to try a taster of the many of food choices that I cook and bake for Cossack Cuisine. I will offer a wide selection of bites, slices and tasters from countries associated with Cossacks of old such as Russia, Ukraine, Azerbaijan, Georgia, Uzbekistan and others. Is there more than just food? We will provide 5 generous glasses of wine to complement the dishes from Russia. Wines will be provided by our associate – TBC – who will also offer you the opportunity to buy any of the wines that you enjoy. Soft drinks and water will also be available. Depending on the number of people attending the event will be held in my house (Sheffield – S20 area) or at a larger venue in Sheffield. Depending on the numbers of people who would like to attend, the price for the food and drink adventure will be between £10 to £20. What else can happen at the event? Email me – leeza@cossackcuisine.com to indicate if you are interested in hearing about when this event will happen. There is no commitment from you by sending me this info. It simply helps me get an indication of how many people might attend. My advice to you is that when planning an event where you will have someone cater the food, it is necessary to know if any of your guests have any specific dietary requirements. This can simply be because someone chooses not to eat certain foods, however others might have severe allergic reactions or religious reasons why they can not eat specific foods. Before you select a caterer for your next event, it is always a smart idea to see if there are any foods that your guests can not or will not eat. This can simply be a question you ask when people send their RSVPs to you. I am able to accommodate any dietary needs you may have. I have a range of dishes suitable for special diets or allergies and I am happy to create new menus. Cossack Cuisine offers an exciting selection of vegetarian and vegan dishes and can provide gluten free options. Please contact me to discuss such requirements. As well Cossack Cuisine, I also enjoy running another food service. I have been making delicious cakes for all of my adult life – that’s over 25 years! You can look at some of my gorgeous cakes in the gallery at my web site > leezascakes.com. If you like any of them and think you would like me to bake you something very special, then you will find details at the web site on how to contact me. Besides yumminess, there are many other reasons why asking me to bake you a cake will assure you that you made an excellent choice. 1. I understand what you want. My cakes are not rushed and never sloppy because I am a perfectionist and the cakes I create for you are custom designs and unique. I pride myself in creating quality, delicious tasting cakes that will exceed your expectations each and every time! I listen to what people want, offering friendly guidance and advice when needed, to make your experience happy and stress free! I am reliable and you can be assured that your cake will be exactly what you ordered and it will arrive safely on the day! 2. I prepare my cakes in a 5-star hygienic kitchen. I use a professional kitchen. It has recently been awarded a 5-star rating from environmental health; in other words, our hygiene standards are excellent! Of course, I also have earned the U.K. catering industry’s Food Hygeine Certificate. 3. I will bake a cake that delivers that “Wow!” moment at your event. I cater for all occasions including; Weddings, Anniversaries, Birthdays, Graduation, Confirmation, Divorce, Christmas, New Year, Easter, Corporate Events, and even “friends round for dinner”, etc. And because you and I work together to create the WOW! cake that you want – your special occasion will be unforgettable not least because of the cake you asked me to bake. For the FAQs about leezascakes.com – go here. The UK’s pioneer of fresh Russian food to take home. At Cossack Cuisine we have first chef in the UK to offer fresh handmade food from all around the former Soviet Union. This includes hearty dishes from the west, to spicy dishes from the south, all for hassle-free serving in your home. Healthy & locally sourced ingredients. Without compromising on the authentic delicious taste, we deliberately augment our food with superfoods and highly nutritious natural ingredients, all sourced locally. Vegetarian and gluten free foods are also available. Delighting British folk with a new foreign cuisine. Run by a a great team, Cossack Cuisine sells all manners of baked Russian savouries, sweets and cakes. They’re often found at Briggate’s World Feast. Be sure to try owner Leeza Murina’ St. Petersburg Pie, made using her grandmother’s recipe. “Cossack Cuisine” is the Russian fresh homemade food company started by Stephen Jones with the input of Leeza Murina in June 2012. Though its origins go back much further. Leeza says: ‘Back in St. Petersburg, where I was born I have my famous musical family to thank for my baking career. I grew up with a mum, grandmother and grandfather who were a celebrated concert pianist, conductor and choirmaster respectively. I was the black sheep of the family – musically illiterate but with such a desire to impress my gifted family with my own talents. With my grandfather’s guidance, I turned my hands to conducting the ingredients of our pantry. I quickly learned how to please people’s mouths as opposed to their ears! After meeting Stephen, who is a chef in his own right, having opened his first restaurant aged 24, Leeza was happy to share her family recipes with him and guide him in the creation of amazing Russian food. It provides Leeza with an opportunity to relax and be creative. Have you any idea how many tweets I’ve retweeted on the basis that I MIGHT win something? No, me neither. But I’m guessing lots… and I bet I’m not the only one! And how many prizes have you all won? Yep, me too. Zilcho. Well, recently my luck changed… very much so for the better and I won a three course meal at Cossack Cuisine for retweeting something about their signature Russian Honey Cake. How very exciting?! All in all, we were impressed with the food at Cossack Cuisine. For me, the highlight was the beef, coriander and cream stew and I think I’ll be trying that again. I’ll also be returning for takeaway lunches of soups and pies (and I want to try the salads), especially when I’m taking a longer lunch and have time to wander down to the market. Have you tried Cossack Cuisine? Full article here with more images of our food too.